Picks reviewed are priced according to countries of source. US dollars, Euros and UK pounds. All reviews here were done on various electric & semi-acoustic guitars. Most of the time, the guitars were not plugged in. This works best for comparative testing IMO. If you always use gain in your rig, most of the variations concerning tone, loudness and resonance described here (which are subtle) will not be noticed. These are a French company specialising in their own unique pick design. The majority of Le Niglo picks share the same basic styling, but are made of different types of metal. The styling differs slightly between four grades N1, N2, N3 and N4. This design styling is ergonomic and it fits the finger & thumb pretty much perfectly. The contact tip however is going to take some getting used to. I will try to use these exclusively for at least 2 weeks - I couldn’t. Read on. Le Niglo design uses a rounded tip profile. However, along the horizontal axis it does have a keen edge, similar to a paper knife. The near edge is heavily bevelled, so a left handed player would need a left handed (mirror imaged) version. I ordered two of these. One made from titanium (NiTi-SG Titane) and the other from chrome (N4 Chrome). Le N4 Chrome : The chrome one is heavier, as would be expected. However its comparative heaviness is also due to having more material mass than the titanium pick. This feels better to me, preferring as I do more substance. The chrome pick is less smooth than I expected, having a satin like finish. This can be heard as white noise when it’s drawn across the strings. If I persevere with this pick, I will eventually try to polish the contact edges to a smoother and quieter finish. The titanium version has less ‘substance’ as mentioned, and feels as if it was fabricated from sheet rather than cast from an ingot (I can find no manufacturing information). There are heavier versions with a duller edge. This one is not really very ‘pointed’ at all. The Titanes come in several colours. The colours are added by anodising. The NiTi-SG version comes in a gold-bronze colour. The anodised surface can wear off, but the metal should not suffer. This seems to produce less white noise than the chrome version, but could still do with some surface polishing (though this will remove the colour I’m sure). The N6 Bronze is shaped like a jazz pick, but is larger (a pointed teardrop or ‘apple pip’), peppered with holes, and feels better in use to me. Fast alternate picking is much more fluid. Again the sound is bright, resonant and quite loud. All three of these picks have handed bevels with a more acute angle than most picks. I have not gotten used to this so far. They also have holes drilled for a cord that can be attached. I choose this option as I like the idea of being able to carry a spare around my neck at a gig. Le Niglo describe this as a ‘jewellery’ option. I suppose they do look quite nice. However all 3 cords have ‘undone’ with very little help from me. Furthermore I have had to discontinue using the Chrome & Titanium picks early on due to thumb pain. The pain is due to Osteoarthritis. I don’t know why the Le Niglo’s bring this on, but I have only been able to spend about 2 hours evaluating them. This is nowhere near enough. The N6-Bronze is fine in use and I plan to use this as a backup at gigs. The Le Niglo site also are an outlet for partners Sayo of India, who make picks from wood and from bone. Sayo picks have a jazz styling, but are much larger. They have multiple holes drilled through for improved grip. These have non-handed bevels so can be used by left handed players equally well. The contact surface is too rough for my liking and will need to be buffed down. It performs similarly to the Le Niglo N6 Bronze. Perhaps rather better. The sound is bright with less resonance. Timber Tones sell a massive array of picks made from all kinds of materials, including leather, Stone, wood, felt, metal, bone, shell and horn. I choose from the Gypsy Tone range as these are triangular and resemble the picks I’ve had most success with. So far as I can tell, the shape, size and bevelling are as per the V-Pick Freakishly Large. They are however, fashioned from much harder and more resilient materials than the plastic V-Picks. Bone is excellent. Ebony is not so far off either. Shape: Triangular with 3 playing edges. The tips are pointed. Edges have a neutral bevel (not handed for right or left) and are in every important respect shapes like pointed ‘V-Picks Freakishly Large’. All the Gypsy picks are 3.mm thick. Sound, feel & grip: -all these Gypsies are smooth and impart no discernible white noise. There is no difference in speed (as when rapid alternate picking) and there is no discernible ‘lag’ at all. BUFFALO (white) BONE : Quite bright and harder than expected. Heavy and perfectly smooth. BUFFALO (black) HORN : Not as hard as bone. Timber Tones say this is the closest tone to tortoise shell. Bright but less so than bone. AFRICAN EBONY : 3220 hardness Janka scale* This is hard and brighter than expected, though it also has warmth. Though hard, ebony is lighter than bone or horn. It is a little louder than either bone or horn. Grip: Surprisingly, the ebony tends to slip between my fingers as I use it, forcing the pick back into my palm. I’ve never experienced this with any pick before. Logically I would expect the grain to provide some purchase, but it slips nevertheless. COCONUT HUSK : Similar to the ebony. This is very hard but lightweight. These picks have a dimple on one side, not I suspect, by design, but because you can’t cut 3.mm of flat material from this concave (shell) shape. This is a serendipitous advantage. The dimple feels good in grip. The difference is negligible but the coconut is marginally louder than the ebony. The tone is also similar, rich and complex. There is a potential problem with some coconut picks because the material is perforated with small fissures. If any surface at a contact point it can spoil the smoothness of picking. I have 3 Coconut picks and one of them has this problem on one playing tip. It not only affects smoothness of contact but the sound too. I will try to ‘fix’ this with a dab of wood glue and file it smooth. For longer single notes, I learned (with V-Picks) to draw the pick across the string beginning at the part of the bevel closer to the flat. The improved contact creates a richer tone including some warmth. This technique works just as effectively with the gypsies, regardless of the materials used. They do sound subtly different from each other. The heavier Bone Gypsy feels nicer in grip, being heavier and cooler, but in every important respect the coconut husk gypsy earns my favour with its ease of use, resilience to wear and its excellent sound. I spent a long time comparing these 4 picks. The bone & horn weigh more and are smoother. They are similarly bright in tone. The EBONY and COCONUT are noticeably louder with richer tones. I have also compared these to the V-Pick (Pointed Large) and they are slightly less resonant. The difference is so small, but I can ‘feel’ more vibration in the neck when I use it. As soon as I can I intend to try this out on another pair of ears. I want to use these picks and ask another person if they can hear a difference. I am just not sure. NOTE: concerning relative pick LOUDNESS. The comparisons made in this review depend on the type of picking technique used. Some techniques seem to contradict what is stated here. Generally speaking, the metal picks produce more resonance, as do picks with greater mass. This is felt through the guitar as vibration. Oddly, more resonance doesn’t automatically mean louder, though I suspect it will sustain better. *The Janka hardness test measures the resistance of wood to denting and wear. It measures the force required to embed an 11.28 mm (.444 in) steel ball into wood to half the ball's diameter. The figure refers to POUNDS (of) FORCE. So this species of ebony is 3200lbf which is equivalent to 1.6 US tons or 1.4 Imperial tons. 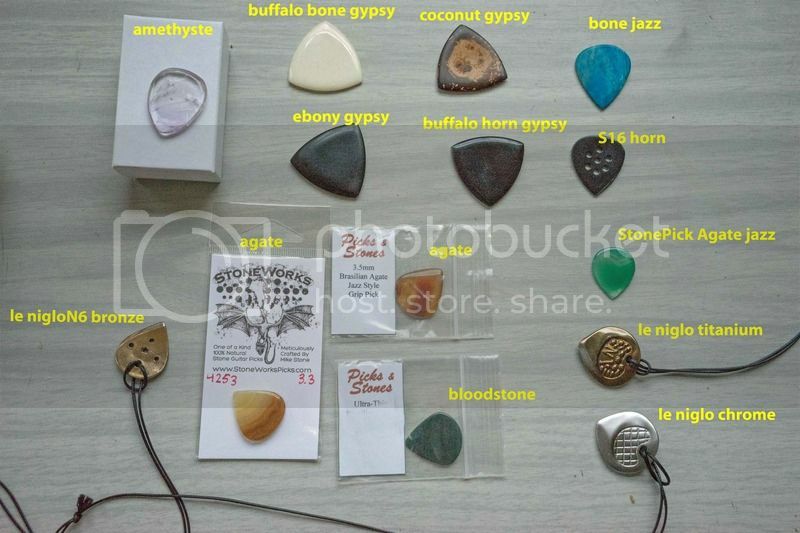 All of the stone picks (excepting the Amethyst Timber Tone) are Jazz picks. These are all small, of a conventional teardrop shape and pointed. The amethyst pick is larger than the other ‘stone’ picks reviewed. It does not have a well defined point. This is ok, but it would suit me better if it did. The sound is similar to the others; being not very loud and having a warmer tone. The stone itself is clear but crazed with cracks. These cracks can be heard where they appear on a contact surface. For this reason I don’t favour this pick. If you like to use gain, it wouldn’t matter. All of the other stone picks are of the jazz styling, being very small teardrop shapes with a pointed tip. It took a few hours of playing to get accustomed to the small size and the acute angle of these picks. Now I can use them all with ease & confidence. For sound, I can safely place all of these in one collective review (StonePicks / Pick & Stones / StoneWorks). They all sound pretty much the same. Only the Bloodstone sounds thinner than the others. I feel quite certain this is because at 1.5mm it has less mass than the others. I would really like to try a much larger stone pick. I think they would produce more resonance. The stone sounds are not particularly loud but they sound warm and pleasing. Great for Jazz. Used on semi-acoustics (Epiphone Casino Coupe and Hofner J-17 archtops) it suits perfectly. All of these stones have well polished playing surfaces. So there is little or no extraneous noise. Handling & grip. They all feel similar. The Pick&Stone models have recesses ground at the grip area. Surprisingly though, the others (which are smooth) seem to grip about as well. The stones seem to stick to the skin. Many manufacturers of synthetic picks make the claim that their materials do this too (adhere to your fingers). In all cases I have found this to be untrue. The stones however actually do. The little stone picks are now a useful addition to my ‘usable’ picks. The one I have been most impressed with is the Coconut . It’s surprisingly tough, loud and sounds great. I think it will eventually replace my V-Picks as the preferred choice for soloing. I always carry a pocketful of guitar picks wherever I go. I love many different types of picks (Fender thin and Fender mediums for instance, depending upon the situation) but my all time favorite seems to be the Dunlop textured pick. Great tactile feel, never slips out of my fingers, and ultra-affordable! Cheers for that my friend. Well I tried many brands & types, but yours is one that slipped my net! I used the same picks for 20 years (Gibson triangular meds & heavys). Only this year did I set about trying lots of others. It's cost quite a bit but its been worth it. I admire you your journey of sonic discovery!! I must admit that, in my band, I am more of a rhythm player and singer, and I only rarely play lead guitar. I favor thinner picks, and only use a thick plectrum while playing bass guitar. * I had a guitar pick tossed to me from onstage by Paul Stanley of KISS (Dothan, Alabama, 1975), but I screwed up and gave it to a girlfriend. What a dumb-a$$ I was. * I have a guitar pick, a Fender Medium, that was thrown to me by Rick Derringer when he was on-stage in Frankfurt, Germany in 1990 or so. He was playing a Steinberger guitar, and touring with Edgar Winter. I treasure this pick. I really like Rick Derringer and Edgar Winter. * I also have a tour pick from Foreigner's Mick Jones, from the 2007 tour. It was collected by my good friend and band-mate Bob, our drummer. Bob gave it to me as a birthday gift last year. I like to use it when we play 'Hot Blooded' (on which I do play lead), and on 'I Want To Know What Love Is'. Hey, thats a hell of a good way to collect picks! Dont apologise. Those are stories to be proud of! I enjoyed the read too. The pick search was in part trying to solve a problem. When recording I noticed that some of the faster picking sounded odd, it was 'late'. The pick 'attack' was all wrong. Part of the problem was the tone-patch on my signal processor. The other part of the problem was my pick. It all added up to an apparent 'lag' of phrasing. This nasty lag appears on a song I recorded a couple of years ago. The solution was to be very careful about constructing tone-patches and to use a rigid pick with a pointed end. I had always liked a small amount of flex in my pick. I still do for chords, but my lead technique had developed beyond the tool I was using for the job. I used to think people were crazy using pebbles and such. I learned the hard way that I was mistaken. I'm curious what metal, stone, or bone picks do to the strings, versus the traditional plastic. Are you talking about the sound? I have tried to describe it in the review as best I could. Or are you concerned about wear? Bone and horn are softer than steel, so is brass. Chrome and Titanium are harder. So is stone, but none of these 'do' anything to the strings. There is no wear or damage. They merely glide over the surface. If the contact surfaces were abrasive, it could do. I have since found some larger stone tri-picks from Israel which are pretty good. Right now, Johnny from Pick&Stones is grinding 2 custom made picks to my specifications. Looking forward to trying those out! Thanks. Based on your excellent review and info, I've placed an order for a stone pick. Thanks again! Hey thats great. Lets know how it goes. It will probably take several hours to get fully accustomed though. Wow, that is quite a body of research. I believe I have heard of stone picks before, but don't think I ever knew anyone that used them. The bass player in my band likes to play 6 string guitar with a quarter (US 25 cent piece), but plays the bass mainly with his fingers and occasionally a plastic pick when the song requires it. I was invited up on stage to play another musicians guitar (solo act) and he was strictly a fingerstyle player. I didn't happen to have a pick with me, but played using a match book. Talk about having to quickly adapt. Thanks for posting all that info I found it very interesting. But for $42 I think I'll probably stick with my medium gauge plastics. I play with boring acrylic picks make by V-Picks or Gravity Picks. Most of the time I use V-Picks too. Though for me, Gravity & the cheaper V-picks need some additional shaping to play at their best. What do you do and what additional shape do you make. I adjust the bevels. The smaller picks (right in both photos) have uniform radiused bevels that follow the pick shape profile at the points. I file to relieve the 'bumps' at the point where the rads join. 1st pick shows (faint) dotted lines of inner shape where bevelled. 2nd pic shows shaded area where I file on smaller pick. The larger picks dont need adjustment. The smaller picks need a little adjustment just to make the pick glide more smoothly over strings. What thickness are those they look like 2.75mm or thicker. They are all thicker than you like. the fluorescent has no relief, It looks molded rather than ground. Those are really thick. I just ordered 2 Red Bear picks and really enjoy my Blue Chip pick. I have some V-Picks and Gravity Picks too. I used to use Dunlop .73 Delrin for a long time. All the years I have been on here and this is the very first time I have looked in on this section. It seems I have been missing good stuff! I have ordered a selection of the Sayo picks (rosewood, bone and horn) as the drilling might well help re my annoying "loose grip". I look forward to trying them anyway. Thanks for the Review merciful. Keep trying different kinds however keep returning to my big stubbys. Blue Chip are pricy but really nice. People complain and say they feel sticky. They definitely have good grip even thought they are smooth. My BC pick does not leave my house. I really dig Gravity and V-Picks as well.